From The Era 26 October, 1932. Farcical comedy deftly devised on broad lines. It seemed that the scenarist never made up his mind whether it was to be farce, comedy, drama, or pot pourri of all. However, it remains a competent production and has strong popular qualities. Good performances by Henry Kendall and Dorothy Bartlam. Watch Beverly is Sound City's initial effort at film production. It is a good start, except for one or two things that can be quite easily remedied. The camerawork, at times, left a good deal to be desired. The story opens very well and has an original twist in the first few hundred feet. Then the film slowed down considerably, and though the story naturally took time to work itself out, it was too long. There was a considerable amount of immaterial detail which could quite easily be deleted and would give the story a snap. Actually the story concerns a young man from the Home Office who is trying to raise the money to build a hospital. He overhears a wealthy but unscrupulous financier plotting with a South American to rob the British Government. He impersonates the President of the country and gets the money —and the girl—after many hilarious adventures. Henry Kendall does very well as Victor Beverly, and Dorothy Bartlam makes a beautiful heroine; little was seen of Francis X. Sullivan’s dynamic personality. Charles Mortimer puts up a good show as the financier, and a girl named Eileen Pitt Marson gives an excellent account of herself in a minor role. “Watch Beverly.” English. A Sound City production, distributed by Butcher’s. Director, Arthur Maude. 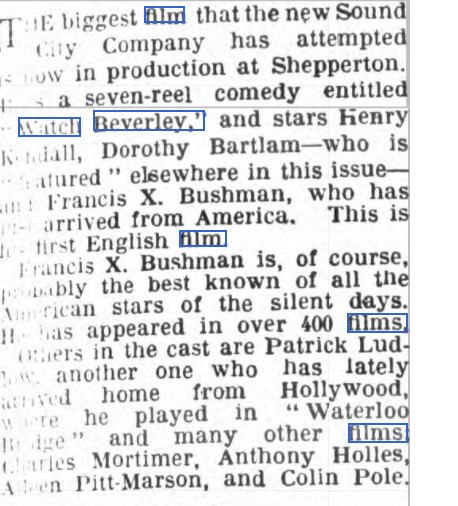 Stars: Henry Kendall, Dorothy Bartlam. 7.146 ft. U.” certificate. From The Era - Wednesday 24 August 1932.